NedCard's latest news and press releases. Oasis Smart SIM selects NedCard to further optimize and secure its supply chain of embedded SIMs for the M2M market. NedCard officially launches its UHF (RAIN) RFID package MicroSON®-3. MicroSON®-3 is a Small Outline No-leads (SON) SMD package, designed for industrial applications. It contains the latest RAIN RFID chip solutions. Read the MicroSON®-3 press release. NedCard obtains a Silver score in the CSR survey of EcoVadis! NedCard has obtained a good result in the EcoVadis Corporate Social Responsibility survey. It places NedCard among the top 30% performers evaluated by EcoVadis. NedCard is very proud to be awarded a Silver recognition level. 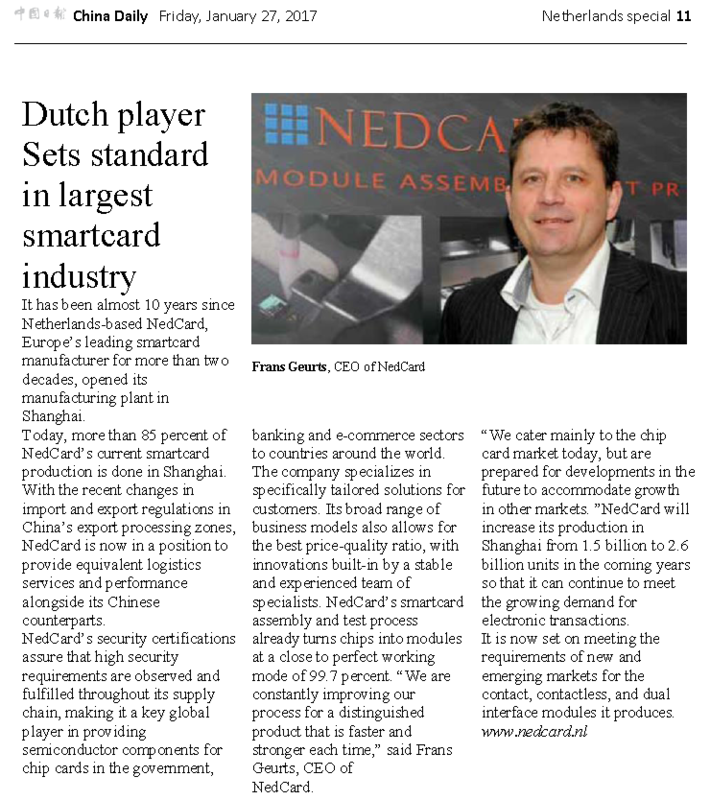 It has been almost 10 years since Netherlands-based NedCard, Europe's leading smart card manufacturer for more than two decades, opened its manufacturing plant in Shanghai. Independent smart card assembly house NedCard will increase its module production in its Shanghai plant from 1.5 billion units to 2.6 billion in the coming years as it shores up its technology platform for more novel applications. NedCard is able to continue its historic growth under new shareholders. NedCard, Dutch leading module assemble house for the smartcard and RFID industry has been acquired by Rabo Participaties together with Matcorp Participaties and the management. Matcorp Participaties, previous minority shareholder, continues as majority shareholder. Frans Geurts (CEO), Thomas Riesterer (CTO) and Eric de Bruijn (CCO) will form the new executive committee and focus on continuing the current growth and strategy of the company. March 14 2016; NedCard obtains highest security certification standard EAL6. NedCard B.V, a world leading independent smart card module assembly and testing house, announced that both of its sites in Wijchen, The Netherlands and Shanghai, China recently received the ISO 15408-EAL6 site certification, being the first independent smart card semiconductor module assembly and test company to achieve this significant certification. (Dutch) interview with NedCard director Frans Geurts: NedCard (Bijsterhuizen) is doorgedrongen tot de top 100 van de maakindustrie. Iedereen heeft wel een product van NedCard - gevestigd op bedrijventerrein Bijsterhuizen tussen Wijchen en Nijmegen - bij zich. NedCard announced today that its Directors and Supervisory Board have approved the plan to further expand the cleanroom space of NedCard’s smart card Module Assembly and Test facility in China, enabling the company to further grow its globally installed production capacity to 1,5 billion this year up to an estimated 2,6 billion units per year by 2018.